Google Voice for S60 | BDC Software Inc. In light of recent Symbian developments and Nokia’s unwillingness to continue improvement of the Python runtime we are forced to discontinue work on GoogleVoiceForS60. We have, however, open-sourced the code to the app and posted it on Google Code. Sorry for the inconvenience and thank you for using the application so far. Necessity is the mother of all invention. Google Voice is great service but without a native app for Nokia phones placing a call through the Google Voice number was a major hassle. In addition, I needed a proof of concept app for developing and deploying an app with the 1.9.x PyS60 runtime. The end result is GoogleVoiceForS60. In a nutshell, GoogleVoiceForS60 pulls a list of all your contacts, dialed, received and missed calls from the phone and allows you to initiate a phone call or send a SMS message to one of these numbers by using the Google Voice API. This application is a work in progress and as such it is in a continuing beta stage. It has been tested and is used in every day on the following phones: N97 NAM, N95-5 8GB and N95-3. 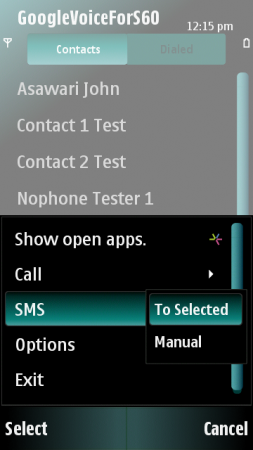 In addition many users reported it works fine on E75, 5800XM, E71 and E71x phones. In theory it should work on all phones that support the pys60 1.9.7 runtime. For privacy reasons the screenshots were done by running the emulator version. There might be slight differences in look and fee in the real application. Please make sure to install all the packages to the same drive (it does not matter if it’s the c: or e: drive). Fixed saving of callback / handset number issue. You have to install Python 2.0.0 or better runtime for this version to work! Fixed authentication issues after recent Google Voice changes. Fixed app crashes after unsuccessful call attempts. Bug fixes to new GoogleVoice API code base. Removed on startup auto-login feature. Rewritten Google Voice API Interop to accommodate recent changes in the API. Added credential caching to optimize speed. In theory placing call should be much faster now. Added default Access Point setting. Once set the application will automatically use that AP for future communications. 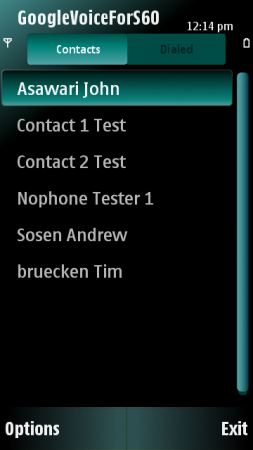 Added workaround for crashes on phones with 1000+ contacts. On startup the app will detect if there are more than 500 contacts and will force the user to specify search parameter to limit the list of contacts it displays. This workaround will be in places until the bug is fixed in the python runtime. Fixed issue, where a popup dialog would ask user to select a phone number on a contact even if the contact had only 1 number defined. 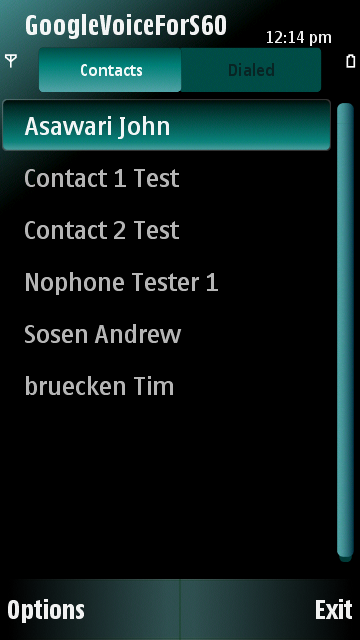 Added wait dialogs and user feedback for call and sms functions. This version will DELETE your existing settings database and you will be forced to re-enter your Google Voice credentials and phone number. Sorry. Received and Missed calls tabs. It’s not intuitive but there are Missed and Received calls tabs in addition to the Dialed tab. You can use the directional pad to scroll right in the tabs or on 5th edition phones slide/drag the Dialed tab to the left.